Royal Bank of Scotland’s departing chief financial officer Ewen Stevenson has said it is not the best time for the Government to start selling its stake in the bank, at a spiky investor meeting in Edinburgh. The state-controlled lender’s top bosses were forced on to the back foot at the AGM by angry shareholders concerned at the bank’s deep branch closures and past mistreatment of struggling small firms. Ahead of the meeting the bank suffered a further setback after being forced to announce the widely-respected Mr Stevenson had resigned to take up an undisclosed “opportunity elsewhere”. Investec analyst Ian Gordon commented the “unexpected loss” of the former Credit Suisse banker was “unfortunate” as he was a “genuinely impressive guy” who had helped RBS navigate “really tough times”. 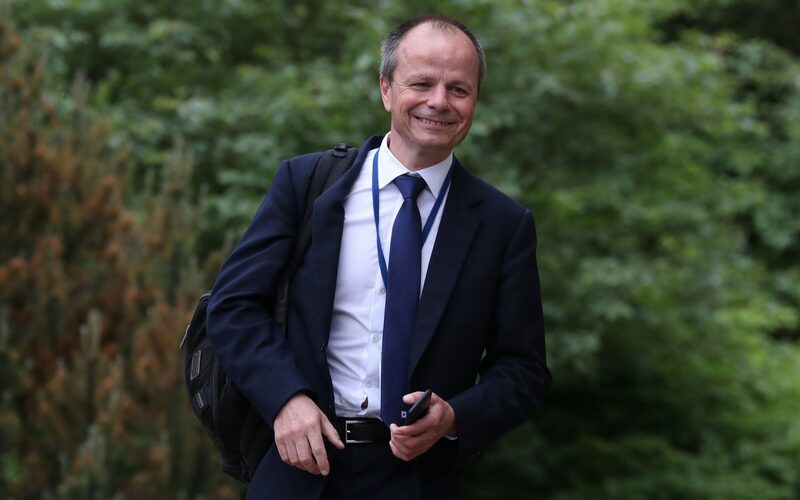 Mr Stevenson told reporters on the sidelines of the event he believed it was not the “optimal” time for the Government to start selling its remaining 71pc stake due to market turmoil in Europe sparked by the deepening political crisis in Italy, in comments confirmed by the bank. A recent run of better news, including its first bottom-line profit since the financial crisis and the settlement of a long-awaited $4.9bn (?3.6bn) US fine for past misconduct had raised expectations the Government could commence the sale as early as this week. RBS has no say in when the sale takes place and will likely get just minutes warning. UK Government Investments, which manages taxpayers’ stake, declined to comment. Mr Stevenson had been seen as a potential successor to chief executive and fellow New Zealander Ross McEwan, amid speculation Mr McEwan could soon leave the post now that the bank’s turnaround is gathering pace. Alison Rose – RBS’s head of business banking – is now seen as heir apparent to succeed Mr McEwan as the likely leading internal candidate. Mr McEwan and chairman Sir Howard Davies sought to persuade shareholders RBS had put the worst of its problems behind it after a “milestone” year. Sir Howard said the resolved US fine also removed “the last hurdle” to restarting a dividend for investors for the first time since its ?45bn bailout at the height of the financial crisis, although no update on timings was provided. RBS executives were none the less inundated with angry questions, with investors calling for a halt to branch closures and for the bank to make further amends for past misconduct. At least two shareholders tried to shout down Sir Howard as he attempted to draw the event to a close. A shareholder motion to set up an investor committee to advise on strategy was defeated after UK Government Investments voted against the proposal. Mark Northway, boss of not-for-profit shareholder society ShareSoc, which had tabled the proposal, had said it would give a voice to “disenfranchised” individual shareholders and was a “win-win”. RBS has announced 421 branch closures across two rounds of cuts over the last six months, representing more than 40pc of its 1,003 branches prior. Scottish MPs this week called on RBS to reverse up to 62 closures planned north of the border. One investor urged Mr McEwan to “listen to communities protesting against branch closures and halt them”. Mr McEwan defended the strategy as a necessary response to a “much more dramatic” shift towards online and mobile banking than expected. “I know people don’t like it… but we need to make the changes,” he said. He warned the bank “will fail” if it doesn’t adapt to the shift to digital. Other investors raised concerns that the full extent of mistreatment of small companies by the bank’s now-defunct Global Restructuring Group (GRG) may not have been fully unearthed, with one claiming it had been an "utter whitewash". A watchdog report into GRG’s failings – which was published earlier this year by MPs after pressure from campaigners – found the unit was responsible for widespread abuse of distressed companies and pushed some into greater financial difficulty. Both Mr McEwan and Sir Howard, who were not at the bank at the time, apologised again for the scandal. A Financial Conduct Authority investigation into former RBS bosses’ culpability for GRG’s misconduct is still ongoing. Others praised RBS’s move to pull funding for dirty industries including new coal plants, announced by the bank yesterday. Sir Howard said RBS would further review its exposure to “climate risk” following the decision. Some shareholders reminded RBS’s bosses that the bank had been “brought to its knees” by past managers and investors had paid a heavy price. The bank’s share price is up over the past year, but is still down 96pc from its pre-crisis peak of ?71.66 in 2007. It closed at 276.1p on Wednesday.